I’m super excited about today's ‘Let’s Chat,’ because it directly affects my beauty routine and my opinion on the industry! The topic is ‘natural/clean’ beauty, chemicals, and greenwashing in the industry. 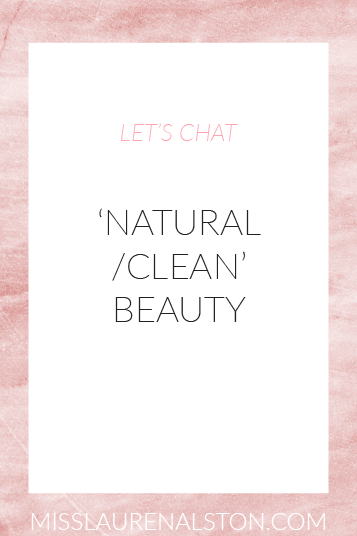 In the past year, I’ve definitely fallen into the trap of ‘clean beauty’, using only products that were chemical free and all-natural. Looking back at my How to Shop Clean Beauty post, this is extremely clear. While I’ve come to understand that not all chemicals are bad and not all natural ingredients are good, I’ve learned more than anything to be aware and be informed. At its core, that post was about looking up the ingredients in your products and ensuring that they aren’t harmful. There are a couple of valid reasons, though, that I’ve become increasingly interested in ‘clean’ beauty and skincare. The first being I learned that there are certain ingredients and products that pregnant women cannot use. Not that I’m pregnant or thinking about being pregnant anytime soon, but if these products that we use on top of our skin could be harmful to a baby inside our body, I’m hesitant to use them. I first looked into this when Summer Friday’s released their first masks and one of the founders, Lauren Gore, said that since she was pregnant when they were working on the formulas it was important that they be made safe for pregnant women. To be honest, I haven’t done that much research on which ingredients this applies to; but, what do you all think about using products that pregnant women can’t? The second reason is that there hasn’t been a significant update to cosmetics regulation since 1938. I first looked into this when I saw that Kourtney Kardashian came to D.C. to speak about cosmetics regulation. Regardless of whether you’re a Kardashian beauty fan or not, I find it so interesting that Kourtney, the sister who is obsessed with healthy eating and does not have her own beauty product line, thought it was important enough to come to D.C. to advocate for the issue. We’ve gained so much knowledge about the ingredients that are used in cosmetics, I don’t understand why we’re not using this information to keep ourselves safe and protected. There’s a feminist argument somewhere in there, but what your thoughts? Many companies and their brands have been criticized for the amount that they advertise their clean beauty products. I see no issue with it for a number of reasons. 1) Why not use this as a way to advertise and differentiate from competitors. While clean beauty is on the rise, not all brands are changing and adapting to the trend. From a marketing perspective, it makes complete sense for a brand to heavily advertise their position as a clean product when their competitors aren’t. 2) Consumers who swore off brands who use certain ingredients or testing methods should be made aware of changes in the products without having to search for it. For example, when I stopped using products that test on animals I stopped looking at ads and new product releases from those companies. If I hadn’t seen on Instagram stories that Covergirl went cruelty-free I would have no way of knowing. Now, maybe I’ll start considering Covergirl products again when I’m makeup shopping. 3) One of the biggest reasons that I support the clean beauty trend is that it spreads awareness. Had I never seen promotion for products that are paraben and silicone free, I’d have never known that those ingredients were bad and I would have continued to use products that have them. By advertising products as clean from certain ingredients, consumers are educated on which ingredients to avoid by the ones that appear most commonly on the ‘free of lists’. This post is getting quite long so I’ll close with one more topic. With the rise of clean beauty, some brands are now labeling their products as clean without changing the ingredients. What’s most important is looking at the ingredients in a product. When I see the ‘Clean by Sephora’ seal, I know a product is free from certain ingredients but I still check and see what it does have. Similarly, I use plenty of products that don’t have that clean seal and by checking the ingredients I know that they are perfectly fine for my skin. As I mentioned earlier, cosmetics regulation hasn’t been updated in a while so companies are free and legally allowed to slap a clean beauty seal on products that may not be thought so by today’s standards. When you see a ‘clean’ or ‘natural’ product, try to find out what it’s clean from or what the natural ingredients are.